Absolute Care Cleaning Services provides a full range of office cleaning services to commercial and industrial premises in Docklands such as office complexes, banks, insurance sector and the manufacturing industry. 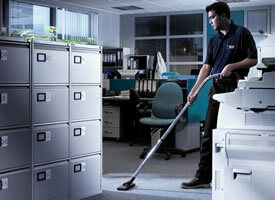 Commercial Cleaning tasks in Docklands include vacuuming, carpet steam and dry cleaning, window cleaning, detailed cleaning (furniture, telephone systems, computers, kitchens) and vinyl floor maintenance. Absolute Care Cleaning Services also supplies cleaning products such as toilet paper, paper hand towels and soap. The office cleaners in Docklands at Absolute Care Cleaning Services are renowned for their quick and effective office cleaning methods that save businesses in Docklands both time and money. Office cleaning services are many and varied, but here at Complex we make sure that all our experience and knowledge of the cleaning industry is focused on every job we take on. For a trusted and reliable office cleaning service in Docklands you can't look past the amazing track record and reputation that Absolute Care Cleaning Services has left behind them.